Is Albarracín the Most Beautiful Village in Spain? How would you feel if you were transported instantly to the Middle Ages? Thats what happened the first time I visited Albarracín, a small town 30 minutes from Teruel and two hours from Valencia, Spain. How would you feel if you were transported instantly to the Middle Ages? Thats what happened the first time I visited Albarracín, a small town 30 minutes from Teruel and two hours from Valencia, Spain. This sleepy little tourist village lies 3,878 feet above sea level, and is unspoilt by modernization. Driving towards the village perched high on the mountaintop evokes a sense of wonder. The Spanish newspaper, ABC.es, had a vote and Albarracín is considered to be one of the most beautiful villages in Spain. Its medieval architecture and narrow streets have been proposed as a World Heritage site by UNESCO. There is much to cherish in a visit to such a long-storied place, but first, a little history. 1. Río Guadalaviar: Take a morning walk along the Guadalaviar River. As the city was built on top of a mountain, the mesmerizing slow-moving river circles the city below like a moat. A walkway was designed with wooden bridges that makes the journey relatively easy. It's certain that as you stroll you'll ponder the historical events that took place over the last few centuries. 2. 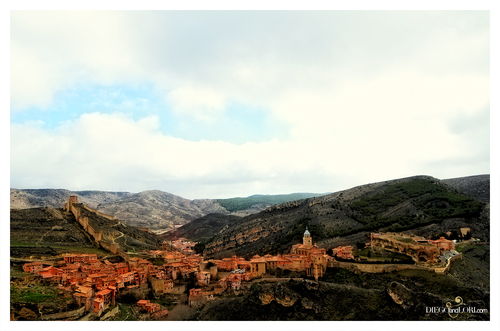 La Torre de Doña Blanca & The Legend: Most villages in Spain have a legend, and Albarracín is no exception. It is aforesaid that the young princess Doña Blanca was banished from her home by her jealous sister-in-law, the Queen of Aragón. The Azagra family, the wealthy lords of Albarracín, took her in on her way to Castile and gave her comfort during her exile. One day, while taking a walk, she disappeared and was never seen alive again. Most believe she was taken prisoner and died many years later in La Torre de Doña Blanca (The Tower of Lady Blanca). It is said that her spirit still remains inside, and she only leaves on a full moon in August to take a dip in the Guadalaviar River below. This tower located inside the cemetery was restored in 2001 as a museum and cultural center with changing exhibitions. Walk to the top and you can see an extraordinary view of the buildings cascading down the mountainside, the Río Guadalaviar that surrounds the city, the northern mountains of Sierra de Albarracín and the southern mountains of Montes Universales. 3. Museo de Albarracín: Formerly a hospital and then a jail after the Spanish Civil War, this museum is presently being used to exhibit art, remains from the castle, and local artifacts. 4. El Castillo de la Ciudad: To visit the castle on the rocky bluff, you must take a private tour by the Fundación Santa María de Alabarracín, as they manage this historical site. The guide shares with you the history of the castle and its remains such as the former baths and salons that once existed. Today, the castle still watches over and protects the village as it did centuries ago. 5. Catedral de El Salvador: Built in the 16th century during a thriving period of Albarracín history, this beautiful cathedral was designed in the typical Aragón Románico-Mudéjar style and built on the remains of an ancient Romanesque temple from the 12th century. The main chapel altarpiece sculpted by Cosme Damián Bas in 1566 represents the Transfiguration of Jesus on Mount Tabor and is one of the most important pieces of Aragonese Renaissance art. 6. Palacio Episcopal y Museo Diocesano: This former Bishop's Palace is presently a Diocesan museum, which features many rare pieces of art that were collected around the world. After the Islamic Kingdom, a bishop was appointed to Albarracín to oversee the town. You can find many unique pieces such as a 16th century tapestry from Brussels, a parish cross and a crystal rock carved in the shape of a fish. 7. La Plaza Mayor: Just before lunch, enjoy a cerveza (beer) sitting at one of the local bars in the heart of Albarracín, La Plaza Mayor, which is overshadowed by the Ayuntamiento (Town Hall). It's a tiny plaza where you can have fun watching the mix of locals and tourists observing each other and children playing fútbol (soccer) in the square. El Buen Yantar: Recommended by the locals, the upstairs dining room only has a dozen tables. So book ahead. The food is scrumptious and I recommend trying the goat cheese and spinach puff along with the entrecote (steak). Rincón del Chorro: Here you are transported to a kind of modern, chic Parisian café in the middle of Spain. It's a bit noisy upstairs in the dining room when full, which has only about twenty tables. Try the pato (duck) with scalloped potatoes, the entrecote (steak) or the ciervo (deer) stew, which is delicious I hate to admit. 9. Ermita del Santo Cristo de la Vega: After a siesta, you can take a walk to this 17th century Baroque chapel. It's only a 15 minute walk along a path and much overlooked by tourists. Once there, you get a very different, peaceful view of the city. Check for times, as the hermitage was closed when I last visited Albarracín, but still worth the view. 10. Torre del Andador: Built in the 10th century, this tower dates back to the Moors and was once a military post. The wall was built later as a fortress to protect the city against invaders. Today, it is considered to be one of the most well-preserved in Spain and became a National Monument in 1931. It is a constant reminder of Albarracín's extraordinary history. From the base, it looks quite high, but the walk is only about 10 minutes. When at the top, you can walk along the ruins and have an exceptional view of the city. Go at sunset to see the dazzling lights from the streets below. La Casa del Tío Americano is in the city centre. This rustic romantic hotel has several rooms in the main building, but try to get a private cabana just steps away with a table outside to enjoy the beautiful view of the cliffside and river below. La Casa Grande de Albarracín is located just outside the city center, but within a five minute walking distance. From this renovated 17th century manor house, you can look up at the mountain-top village from your spacious suite, excellent for families. Run by an ultra-hip and contemporary Spanish family who speak English and Dutch, they take great pride in making your stay enjoyable. Savor a glass of wine by the fireplace or sit outside on the stone terrace reading a book. During the summer, you can have breakfast in their garden. On your way to town, don't forget to pop by the Museo de Juguetes. It features dolls and old classroom items from the 1950´s Spain. 12. All Year Activities: For such a small city, there are a surprising number of cultural events all year round. The Fundación Santa Maria Alabarracín is at the core hosting several events. Known to provide grants and housing to artists, Albarracín is a very creative town featuring artist exhibitions, piano recitals, string quartets and other concerts. It also hosts seminars in classical music, illustration and design, painting and photography. Check out the Fundación Santa María De Albarracín for a list of their events. 13. Festividad de Santa María de Oriente: In September, this week-long festival celebrates the saint of their village, Santa María. The entire village joins together in the town hall for an animal auction, music, and dance. They participate in sporting events as well as compete in the traditional Aragón card game, guiñote, at the local casino. Bulls run in the streets, fireworks are set off and a costume contest brings out the celebratory spirit of the villagers. As you walk through the medieval streets, you will be constantly reminded of its history and the noble families who once lived there. It is a true Spanish experience and not to be missed. Which is your favorite town in Spain? Share with us below. Thank you Evelyn Murciano Ertl from the Fundación Santa María De Albarracín for her historical expertise. Is Albarracin the Most Beautiful Village in Spain?